*warning – there are pics of dead fish below! We have a well established pond (10 years+) stocked with large and smaller goldfish (some offspring that were born a couple of years ago). Most of the larger fish came with us from our previous house and must be about 15 years old. They live side by side with a couple of large frogs as well as the usual garden pond wildlife. I must point out – the garden where we have the pond is down a path 150ft away from the house (that’s how the gardens were divided when the old mill was changed to domestic use about 120 years ago), so during the winter I often don’t venture out there for months at a time. The path can get slippery and the hedges encroach and there is no reason to go down there until spring/summer! Every year around early spring, some frogspawn appears in our pond. In previous years, it has been quite a small amount and the 30 or so goldfish have always managed to eat it before any rescue operation/human interference. Last year I managed to take the spawn out and add it to a smaller tub that I have next to the pond. In this way the tadpoles were ‘saved’ and allowed to grow into frogs without the fear of being eaten by the fish. This year I noticed a large amount of spawn and thought to myself ‘I must get that out’ – setting it aside for a weekend job, or for an evening after work when I had a bit of time. However a few days later (it may have been longer – as I mentioned before I don’t venture down to the garden much until the weather is good) when I came to do this job, I found that the tadpoles had hatched, so it would’ve been impossible for me to remove them now. The fish seemed to be largely ignoring them so I thought that maybe some would survive the onslaught by the fish if they hid in the undergrowth…boy was I right. My concern began a month or so ago. As the weather warms up, I start to feed the fish and usually they gradually emerge, popping up to enjoy some yummy pond sticks. The weather had been perfect for pond weed growth – so the oxygenating plants had become somewhat dense. At first I saw a couple of fish and thought nothing of it, but I did notice that some tadpoles were latching themselves onto some of the fish food and making short work of them. One piece would be surrounded by tadpoles and they would swim round munching it – like swimmers attached to a float – until it was gone. Over the past few weeks I have visited the garden more, and have fed the fish – not waiting to see them come up and eat but carrying on with the gardening or whatever, and not really thinking about it. Yesterday I started to pull weed from the pond to look for the fish – we haven’t seen any alive now for a few weeks. There was so much weed. Having removed about three bucket loads, I swept the bottom of the pond with my net to see if I could find the fish. 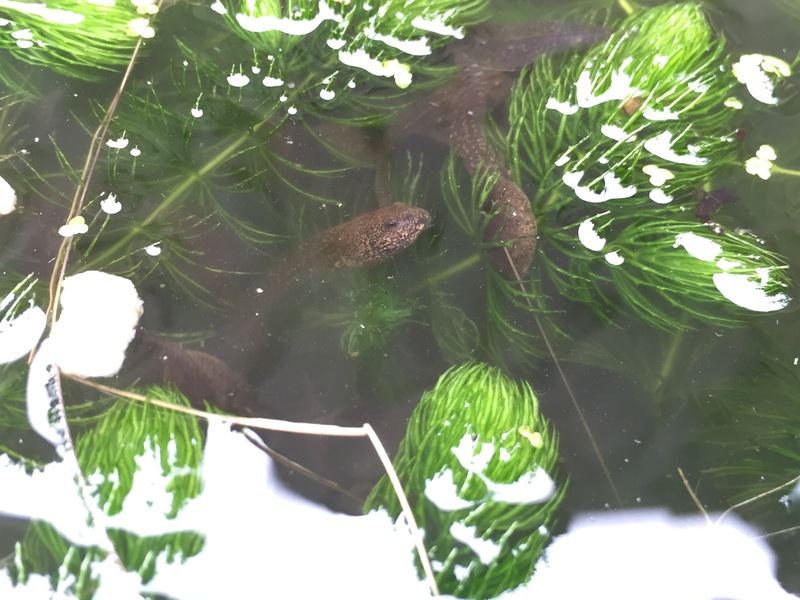 Nothing – however, everytime I brought the net up it was teeming with squiggling squirming big fat tadpoles, 100s of them (see video below). I was starting to get really worried. There were no fish – absolutely NO FISH, not one. I couldn’t believe that the tadpoles had done this until I looked it up on the internet and found an article which describes our situation exactly, environment was in favour of the tadpoles – dense undergrowth to hide in, conditions were less favourable for the fish – dense weed so unable to swim quickly. It finally dawned on me – THE TADDIES HAD EATEN THE GOLDFISH. OMG. Now I was sad. The goldfish that we had nurtured and kept alive all these years – even having their own offspring, had been wiped out by a deadly force of tadpoles. Eaten alive in their own pond. I felt a little sick to my stomach and very guilty that we hadn’t cleared the weed and that we hadn’t removed the spawn. But we weren’t to know. We didn’t know the evil that was lurking within. The poor fish had been struggling to swim through the weed and were being pounced upon by gangs of unforgiving, marauding, carnivorous, growing, hungry tadpoles. This was horrendous. At dusk I re-visited the newly cleared pond. The tadpoles were now clearly evident making quite noise as 100s of them were coming up and taking their gasp of air, making a popping sound each time. The pond was alive, alive with very fat tadpoles, some now having both back and front legs, almost whole frogs. I added some fish food just to see what would happen – within minutes the food was surrounded by ravenous squigglers who made short work of it. We also noticed that some tadpoles were being eaten too, anything that stays still too long or is weak is fair game. I have come to look upon tadpoles in a whole different light. My naive childhood memories of looking after them, feeding them meat until they turned into frogs have evaporated and now all I can think of is the shoals of dark, hungry fish-eating destroyers that are currently residing in my pond…. I will never look at them in the same way again. which I cannot help but find cute!! Oooohhh, I’m all squeamish after reading your post and will never think of tadpoles the same way again after seeing your videos. They certainly are fat wriggly things. Will you replace the fish do you think?